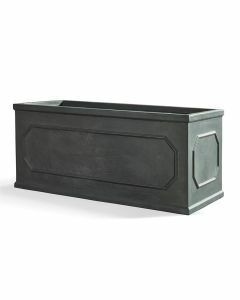 This beautiful outdoor garden trough features a faux lead finish so that retained salts, fertilizers, and rain will be absorbed for a natural and attractive aging process. This beautiful outdoor garden planter features a faux lead finish so that retained salts, fertilizers, and rain will be absorbed for a natural and attractive aging process. Item measures 19.5" x 19.5" x 23". Click on image for greater detail. This item ships via motor freight.e for greater detail. This item ships via motor freight.